I had my first run since giving birth today. 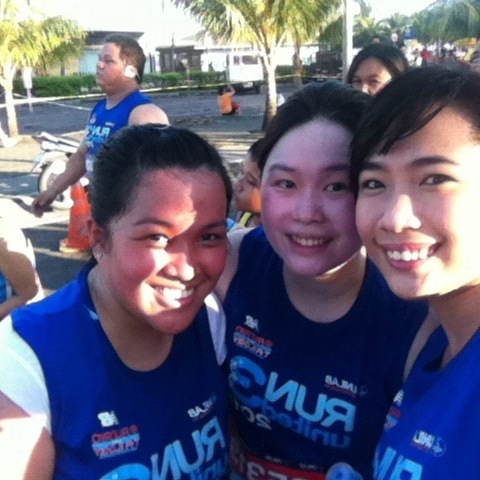 I ran the 5km of Run United mainly sponsored by Unilab. The run was well organized by the Run Rio group. Since Hubby was running the 15km, I thought I’d be alone running. Good thing I met Vanessa and Liezlda in the starting line. Both are first time runners. Proud to say we finished the run in a little over 45mins. 9minutes/km is not bad at all considering I’ve only practiced twice before this race. The finisher’s kit included a shoe bag, sports bottle, and product samples. Next stop is the HSBC 10km run. For that, I will need to practice!